As part of their Modest Mouse reissue campaign, Glacial Pace has brought Interstate 8 to vinyl for the first time. Of all of the Modest Mouse records out there, this was probably the one I was least familiar with going in, or so I thought anyway. Turns out, many of the songs on Interstate 8 ended up on other albums. This is likely common knowledge and I'm probably the only goof that didn't know that. I still enjoy listening to Interstate 8 on its own as the songs have a different context than when they're plucked out an placed amongst others, but at the end of the day I prefer listening to Building Nothing Out Of Something for my day to day dose of "All Night Diner." 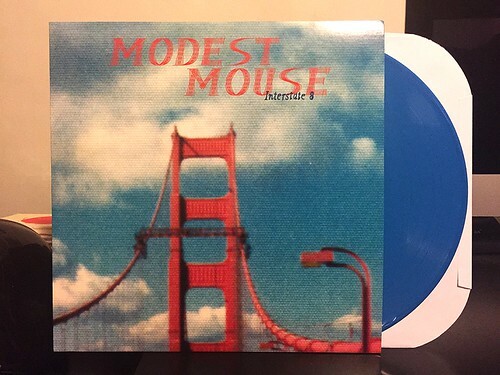 The Europe only blue vinyl looks great. I've heard some folks complaining about the sound, but mine seems totally fine to my untrained ears. It's worth a pick up if you want it, but it is probably the least essential of the Modest Mouse reissues if you ask me.